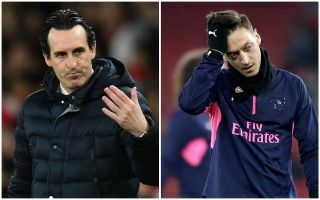 Arsenal manager Unai Emery has discussed how he says sometimes it’s necessary to try and provoke players to get them to a higher level – which could be taken as a hint over the current situation with Mesut Ozil. The German playmaker has found himself increasingly frozen out at Arsenal this season, and that has led to some speculation he could be on his way out of the Emirates Stadium. Tuttomercatoweb claim Emery is keen to offload Ozil, with the 30-year-old being offered to Juventus and Inter Milan as they try to get him off their wage bill and clear funds to sign Yannick Carrasco. However, it may be that Emery’s hard-line approach to Ozil is simply a way to coax better form out of the player, as he explained this tactic in an interview with Sky Sports, though without mentioning Ozil in particular. ‘At certain times, you have to provoke friction with footballers,’ the Spaniard told Sky Sports. ‘From that friction, you can get something more out of them, something from inside, a greater sense of ambition or maybe even a complaint – a complaint regarding the team can be positive. ‘As a manager, you have to be careful because that friction can break a relationship. But I believe in always looking for more, both individually and collectively, with conversations which are comfortable but also with conversations which are less comfortable. Arsenal fans would probably welcome Ozil getting back into the team at some point, with replacing him likely to be complicated and expensive, while the former Real Madrid man is still a class act even if he can be frustrating.